The biggest early game was between Florida and Miami. The Gators came out flat, Miami’s defense was aggressive, and the Hurricanes took the win, 21-16. On Fox Sports 1, Clay Travis said that UF quarterback Jeff Driskel should’ve been looking to run the ball more than he did, and I agree. The game was ugly, and Driskel did little to infuse a dynamic element into the sluggish Gator offense. Georgia bounced back from its week 1 loss to Clemson with a win against South Carolina that should have surprised no one, but which certainly surprised the already half-crazed Bulldawg fans, who were reeling after their loss to the Tigers. UGA came out on fire in both halves, beating back a twenty-one-point second quarter for the (internally) Fighting Gamecocks on their way to a 41-30 victory. In a somewhat uglier game, Michigan beat Notre Dame by that same score under the lights in Ann Arbor. Michigan quarterback Devin Gardner showed flashes of brilliance and idiocy on Saturday night, but connecting with receiver Jeremy Gallon for three touchdowns and almost two-hundred yards was much more of the former variety. Michigan’s successes, together with ND’s various shortfalls, had Brian Kelly speaking in tongues by the second quarter. Oregon’s reverse-Lewis-and-Clark campaign to draw more East Coast attention was in full shock-and-awe mode in Charlottesville, where the Ducks scored very early and very often. Nike 59, Thomas Jefferson 10. In a game with indirect national-championship implications, Illinois demolished Cincinnati, 45-17. That result made this game a nationally relevant one. Louisville’s weak-schedule bid for a spot in the BCS national championship depended almost entirely on the Bearcats being seen as a legitimate opponent making for a quality win. Cincinnati’s loss to a middling Big Ten team like Illinois is a significant blow to the illusion that Louisville’s schedule would stack up against those of leading teams from other conferences, and there’s nothing the Cardinals can do about it. In the late game, ALDLAND favorites Washington State defeated USC in Los Angeles. The Cougars posted a very un-Mike-Leach-like ten points, but Lane Kiffin’s Trojans only mustered seven, dealing USC its first home-opener loss since 1997. A final bit of schadenfreude comes to us courtesy of Mac Brown’s Texas Longhorns, which lost to BYU by an even wider margin, 40-21, giving up more rushing yards (550) than a Texas defense had ever surrendered. This obviously wasn’t in Brown’s long-term plan: he was banking on a couple of dynamic DBs who ended up at other Texas schools. In further evidence of Brown’s rational thought processes, Brown responded to the defensive letdown by firing his defensive coordinator the next morning. For pregame viewing, I chose the new pregame show from CBS’ new-ish twenty-four-hour sports channel, CBS Sports Network. 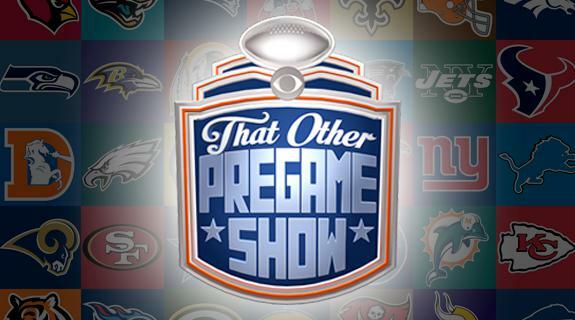 The show is called “That Other Pregame Show,” or TOPS, and I liked it. In structure and tone, the show is simple but meaty. In place of a revolving panel of thirteen shouting former players and undefined, shifting “segment” concepts, TOPS offers a consistent panel of four people– former player Bart Scott and former Raiders CEO Amy Trask, along with host Adam Schein and Brandon Tierny– with a sidebar for news and fantasy updates from Allie LaForce and Nathan Zegura. Trask, the NFL’s first female CEO, is TOPS’ hidden gem. She bucks sports talk conventions as well, more often for better than for worse. Throwing to Zegura for fantasy updates at every position was a bit tedious, but LaForce kept those segments on-track and watchable. Sports Illustrated media critic Richard Deitsch’s comments on the show are here. Can ALDLAND buy a sponsor? For NFL season, the high-class fan should be drinking Budweiser Black Crown. Just like the Michigan State game I mentioned above, locating a television showing the Detroit Lions game, which was airing on the same network and at the same as the Falcons, is something of a white whale here, but if I have to go to a great barbecue restaurant to do it, then call me Ahab. The game itself is too comically terrible to recount here or anywhere, but the Lions did two important things Sunday: 1) establish a legitimate running game, thanks to Reggie Bush and Joique Bell, and 2) win, and beat a division foe at that. Detroit 34, Minnesota 24. From the Falcons’ perspective, their game was the inverse of the Lions’ game. They opened up in the Superdome against division rival New Orleans, played well much of the game, and blew it at the end. Atlanta’s new retread running back, Steven Jackson, wasn’t quite Reggie Bush on Sunday, but the Falcons’ defense looks to be their real problem going forward. 23-17 Saints. The Titans nearly held the Steelers to the two points they gave them on the opening kickoff on a play of sorts in which Darius Reynaud toppled Denver’s Danny Trevathan’s short-lived reign as king of Football Idiot Mountain. Thanks to the exploding body parts of Pittsburgh’s Pro Bowl center Maurkice Pouncey and linebacker Larry Foote, the Steelers didn’t have much fight in them. Tennessee 16, Pittsburgh 9. Speaking of Denver, the Broncos hosted the Baltimore Ravens, defending Super Bowl champs, for the season-opener on Thursday, where Peyton Manning turned in an historic performance, throwing for seven touchdowns in the win. Only a handful of quarterbacks have pulled a reverse Ty Detmer, and nobody’s done it since the 1960s. Despite all of the fireworks, commentator and former quarterback Boomer Esiason thought the “best part of the game” was when Manning took a knee to run out the clock at the end of the game. 49-27 Broncos. The Jets jetted their way to a very Jets win thanks to a Tampa Bay personal foul on the penultimate play of the game that moved New York into Nick Folk’s field-goal range. Buccaneers 17, Jets 18. True tragedy struck in San Francisco, where a fan died after falling from an elevated walkway at Candlestick Park. Two other fans were hurt in Indianapolis when they fell after a railing gave way. For week one, the NFL offered two Monday night games. Because I was having my feelings addressed by The National, I did not watch any of the first game, a faceoff between Robert Griffin III’s reconstructed knee and Chip Kelly’s college offense all growed up. Kelly’s Eagles won, 33-27. I caught the end of the first half of the second game, when it looked like San Diego would beat Houston in a snoozer. I snoozed, and I missed a big comeback by the Texans, who won 31-28. Next Week’s Best Games: Alabama vs. Texas A&M, 3:30 on CBS; San Francisco vs. Seattle, 8:30 on NBC. Final Note: I still don’t have any fantasy football advice to offer, and that’s not only because all three of my teams lost in week one, but in the spirit of Drew Magary’s weekly Chris Johnson Memorial Fantasy Player Who Deserves To Die A Slow, Painful Death award, I’ll send fantasy death wishes to LeSean McCoy, the Philadelphia running back who did little more than disappoint after I took him fifth overall last year. I put him low on my draft boards this year, and all he did last night was rush for 184 yards and one touchdown. LAST YEAR WAS YOUR FANTASY CONTRACT YEAR, LESEAN! This entry was posted in ALDLAND and tagged amy trask, ann arbor, atlanta, austin peay, baltimore, bart scott, boomer esiason, brian kelly, broncos, byu, cbs, chargers, chip kelly, cincinnati, clay matthews, clay travis, colin kaepernick, college football, danny trevathan, darius reynaud, denver, detroit, devin gardner, eagles, falcons, florida, georgia, houston, illinois, jeff driskel, jeremy gallon, joique bell, lane kiffin, larry foote, lesean mccoy, lions, louisville, mac brown, maurkice pouncey, miami, michigan, michigan state, mike leach, new england, new orleans, nfl, notre dame, oregon, patriots, peyton manning, philadelphia, pittsburg, ravens, redskins, reggie bush, robert griffin iii, saints, san diego, south carolina, south florida, steelers, steven jackson, tennessee, texans, texas, titans, ty detmer, usc, vanderbilt, virginia, washington dc, washington state by AD. Bookmark the permalink.